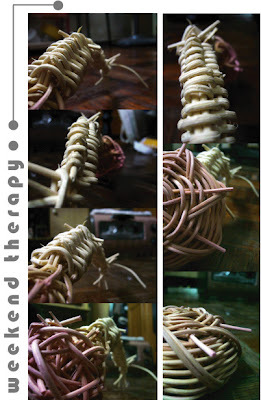 restnrileks : ): Weekend Theraphy and awesome rattan crafts. Weekend Theraphy and awesome rattan crafts. Asalnya, anyaman rotan ini hendak dijadikan sesuatu produk rotan berasaskan lingkaran. Kiranya, konon sessi terapi aku di hari cuti mingguan la. Tapi entah macam-mana, sambil menganyam, mata pula tak lekang menatap siaran yang terpancar di televisyen. Alih-alih, sedar, produk anyaman rotan jadi ntah ke mana, lain pula yang jadinya. Tak pa, lain kali boleh cuba sesi terapi ni lagi. I thought of doing some weaving during my last weekend. It was a good idea to move on from my "gloomy feel" that was taking the center stage of my life. Weaving might do some good to soothe my mind. Earlier, I had fixed on making simple stuff (a typical small basket), but with just a little twist. I wanted it to be a bit different by weaving in a circular motion instead of the usual starting at the base technique. Unfortunately, i was distracted. Damn! !..Seemed that my focus was more onto the program aired on the tv (hey..it was a good show) that i finally ended with something i didn't even know where to begin with. Such a strange thing looking at the unfinished work (caterpillar look a like maybe. Still, i don't have a gut to put the whole complete picture). But it did give me some insight on how to improvise to a more distinctive look. Hopefully, i would post the new look, should i ever finish making a new one. hehe. There is also another project that i would like to finish. 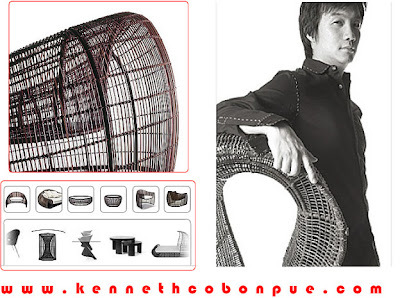 A fruit bowl of simple rattan structure would serve as a basis of the design. Less material, less weaving, same repetitive design and perhaps some light wood carving to compliment the idea, giving it a whole modern yet traditional feeling. 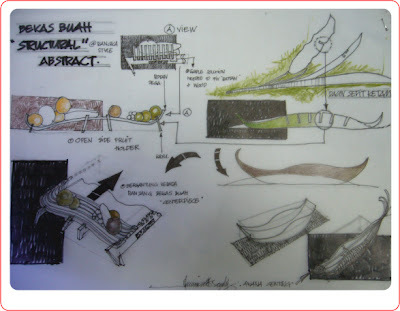 An organic form would portray its fluidity as a whole. This is my initial sketch though, after which i develop and refine to better forms. Structural rattan forms seem to dominate my style for its simplicity yet strong attractive feeling. There are whole lots of structural forms playing in my mind right now. I need to do some juggling heh. It seems that i have more projects in my hand than the ones been carried out. ya you are also right there are lots people who are full of talents. But remember that every person have there unique talents just we have to find it and utilize it.There are no secrets to success. It is the result of preparation, hard work, and learning from failure. You have more experience ……so keep it up….. cheers and happy blogging ……. true true.. perseverance and hard works will prevail finally. have a good day ya..